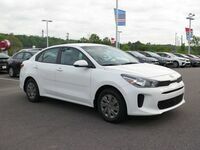 The 2019 Kia Rio is the perfect stylish and affordable sedan for everyday drivers. 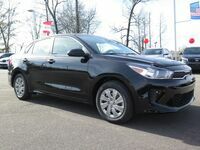 This Kia offers drivers the ideal amount of space for day-to-day driving and weekend getaways. Drivers can choose between the LX and S trim, which both offer feature-filled interiors and sleek, aerodynamic exterior designs. The 2019 Rio from Serra Trussville Kia starts off at a budget-friendly $15,390 and is available in Clear White, Silky Silver, Phantom Gray, Deep Sea Blue, Currant Red, and Aurora Black exterior color options. Continue reading below to learn more about the stylish design and impressive performance of this fan-favorite sedan in Birmingham, AL. 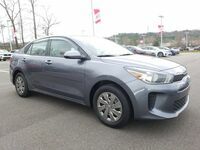 A 1.6-liter I-4 engine paired to a re-engineered 6-speed automatic transmission sits beneath the hood of the 2019 Kia Rio and generates 130 horsepower and 119 pound-feet of torque on the road. 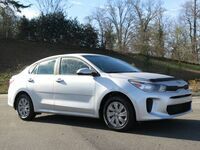 The Rio has earned an EPA-estimated 28/37/32 (City/Highway/Combined) mpg, letting you go further between stops for gas behind the wheel of this Kia. 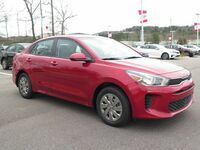 The 2019 Kia Rio has been manufactured with Advanced High-Strength Steel and insulating materials to give drivers their smoothest and quietest ride yet. These materials make talking in the Rio easier than ever by keeping outside noises out and conversations in. The unique bumper and striking tail lights add to this vehicle’s presence on the road, demanding attention at every turn. The strong design lines used across the exterior amplify the aerodynamic silhouette of the Rio. Weekend getaways with your friends in the Kia Rio are made easy with the 89.9 cubic feet of passenger volume and 13.7 cubic feet of cargo space. The available 60/40 split-folding rear seats make expanding the cargo area and adding space for bulky items easier than ever. Plush seating throughout the cabin keeps everyone comfortable on long and short rides inside the Rio, making every drive feel like a luxury.